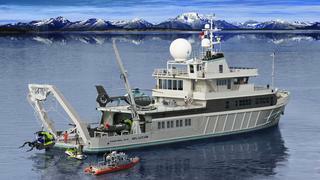 We are very proud to present the private expedition yacht and submersible support ship ALUCIA. in the world today, she is a true hybrid – combining state of the art exploration, scientific and filmmaking capabilities with five­star accommodation and comfort. 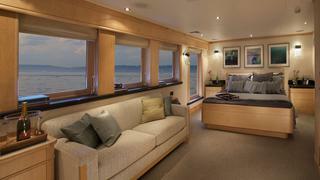 At 183 feet, she offers the working versatility of vessels many times her size. Originally bearing the name Nadir, she was commissioned as the support ship for the French research submersible Nautile. Under the management of IFREMER, Jacques Cousteau’s government sponsored research organization, she has shown a long and successful track record in the field of global, deep oceanographic research and under her current owner for the last eight years she continues that. ALUCIA has seen the redesign and replacement of almost 100% of her pipework, wiring, machinery, joinery and equipment, as well as the addition of many new systems. A thorough reworking of her superstructure has given ALUCIA a submersible hangar, a sundeck and a helicopter pad. Every piece of steel in her hull and critical structure has been tested and brought into accordance with class requirements, and she has benefited from the application of yacht­quality finish. To an observer sitting in the Pilot­House's comfortable settee, ALUCIA’s bridge is an overwhelming and impressive array of flat­screen monitors, switches, lights, dials, levers, handsets and keyboards, all nestled into a 34­foot sculpted, metallic graphite bank beneath her six forward­raked windshields. Twin rudders capable of moving independently can be controlled manually or via the ship’s autopilot, enabling effective manual station keeping when used in conjunction with her two 1600 horsepower main engines powering twin fixed pitch propellers and powerful 360­degree diesel MTU bow thruster, which is capable of propelling the vessel at 2.5 knots, making light work of slow close quarters navigation. Modern Quantum active zero speed roll­stabilization makes for a steady platform underway and while at anchor, minimizing stress on passengers and equipment. Powerful communications are available on the bridge and in the adjoining Radio Room. Her sonar capabilities are without parallel among yachts of any size and offer a critical lens through which to map potential deep­dive opportunities. With the highly sophisticated equipment represented in her scientific and submersible capability, nothing has been skimped on or left to chance in the execution of ALUCIA’s onboard electronics, power generation, navigation, communication, security and control systems. The Mission Control room is the brain­center for all sonar, ROV and submersible operations. Here scientists and technicians can coordinate, monitor and record activities on deployed underwater assets, the bridge, dive deck, tenders, remote teams, and the world at large via hard­wired radio and satellite communications. Four independent workstations share access to a wall­mounted array of five 42” LCD monitors and a 7 terabyte server, allowing powerful collaborative control of multi­beam sonar and other science­related operations. Centrally located, it overlooks all dive and submersible operations and is adjacent to the Media Room and Laboratory spaces. State of the art systems converge here in a climate­ controlled, richly appointed suite designed with the long­term comfort of its operators in mind. The Media Room is similarly futuristic. Two completely independent workstations allow simultaneous post­ production in almost any digital format, from still images to uncompressed high­definition video. Massive RAID storage of 10.5 terabytes and automatic tape backup systems offer flexibility and security while a large common monitor and the ship’s satellite capabilities facilitate collaborative workflow with resources aboard and ashore. Sound quality is appropriate to a high­end creative suite. This Apple driven editing studio will make any professional filmmaker feel entirely at home. 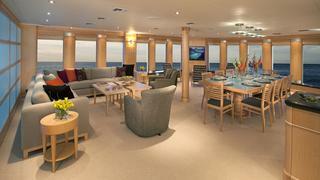 Also adjoining the submersible hangar is an insulated and fiberglass­lined walk­in Aquarium Room. Specially designed for research and documentation of sea creatures in their natural environment., This space is light­tight, fully climate controlled and provides dedicated work­surfaces and storage for husbandry supplies and equipment. All plumbing for these systems is dedicated and designed to minimize contamination and acquisition of unwanted metals. A protein skimmer and professional­grade filters along with a reservoir tank and powerful coolers allow for safe deep habitat replication even in tropical waters. Across the hangar, a two­room suite provides the bulk of ALUCIA’s multi­use Laboratory Workspace. Numerous 120V and 240V outlets support flexible bench­style work­surfaces and extensive cabinet storage. In the wet lab, a professional fume extraction system, fresh and salt water plumbed into stainless­ steel sinks and counters. A self­draining floor allow for messier projects. The adjoining Dry Lab provides access to the ships interior and protection for owner and client­provided equipment. Centrally located, ALUCIA’s medical room provides a single evaluation bed as well as provision to mount a table­height stretcher/spine­board suitable for both water­rescue and air­evacuation. Cabinets and drawer storage, as well as a sink, provide easy access to materials required for patient stabilization or diagnosis. A large compartment provides space for owner­provided tools and spares and workspace for maintenance of the ships electrical and mechanical systems. Space and power has been provided for the installation of a lathe, mill/drill, parts washer, and other owner­provided equipment. This well­lit room’s proximity to the Engine Room, generators and Dive Locker make it an ideal multi­use space for keeping ALUCIA in top mechanical form. For operations in sensitive habitats, effective waste­management is of paramount importance. A special room houses a clean burning, high­temperature incinerator for all non­metallic garbage, which exhausts through the ships stacks. All wastewater is treated aboard in a sophisticated, chemical and bacteria­free electrolytic processor, creating a clean emissions vessel suitable for use in polar, coral and estuarine environments. This system meets the USCG and IMO standards as a type­2 treatment facility. Oily water and sludge are also handled aboard, maximizing tank space and reducing the frequency, volume and expense of disposal ashore.